Home / 2017 / concert / music / OMG! 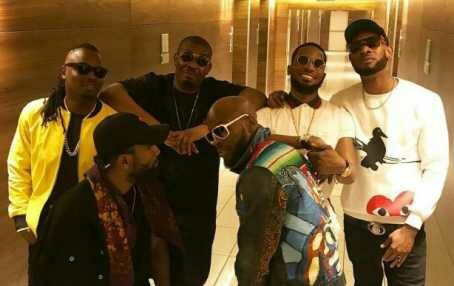 Mo'hits Records reunion and performance at Davido's 30billionConcert. OMG! Mo'hits Records reunion and performance at Davido's 30billionConcert. Top Nigerian Sensation and Hit maker, Davido has reunited one of Nigeria’s most favourite boys band, The Mo’Hits at his ongoing 30BillionConcert. Davido had earlier announced that he had got a surprise for the fans and indeed, this one is "zing". The Mo’Hits crew which comprises of production: Mavin boss, Don Jazzy, The Entertainer: D’Banj, The Vocal Powerhouse: Wande Coal as well as Dr Sid, K-Switch, Ikechukwu and D’Prince had gone on a very painful split in 2012 over several internal disagreements. They were everyone’s favourite pop group and this is the first time the Mo’Hits is reuniting since their split five years ago. According to Davido, it took him two whole months of effort to bring this moment into fruition and it's all worth it. From Wizkid and Davido's reunion, blessing fans with the surprise performance at WizkidTheConcert to the Mo’Hits reuniting at Davido’s 30BillionConcert, 2017 has become an important year in Nigerian music that will not be forgotten in a hurry.